This image was taken from the book ‘Hove in old Picture Postcards’ by Judy Middleton. The history of this park goes back to 1895, when the twelve acres cost the council £5,368. The open land to the north is now built over, but in this photo you can see Aldrington (the name given to this area) is situated on the flat Sussex coastal plain, gradually tapering to the sea. If you could turn 180 degrees you would be facing the sea, just a moments walk away. The two houses in the picture are still there, on the corner of Portland Avenue and New Church Road. 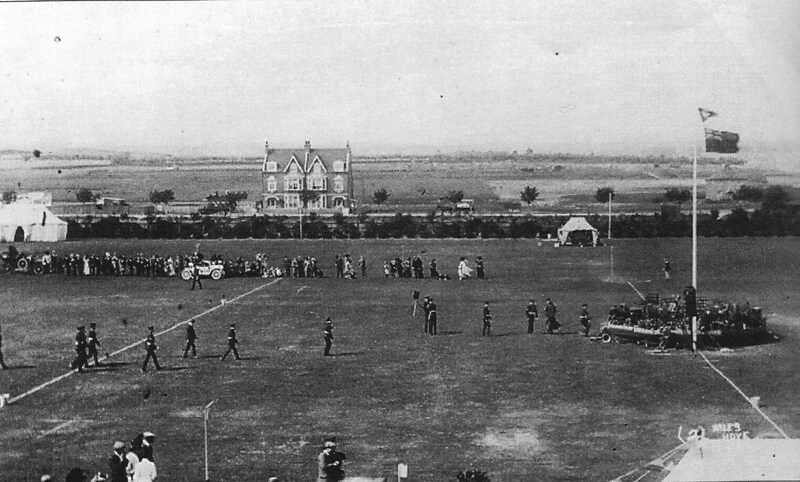 In Eddie Scott’s book ‘Hove A Pictorial History’ he features the same picture, mentioning you can see a band playing, and pointing out this is the time when motor shows are beginning to replace traditional gymkhana’s (horsemanship displays). 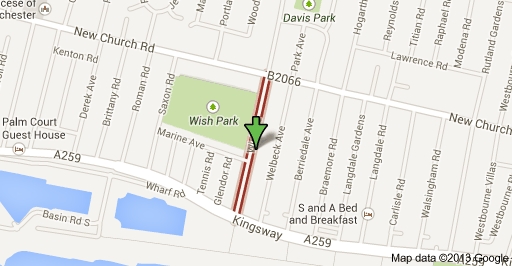 Here is a map, the green arrow is pointing at the corner of Wish Road and Marine Avenue, where we lived. Looking at local Directories, it is possible to trace the history of Marine Avenue, where we lived at No. 5. The first mention of it is in Pikes Directory, 1910, the year the park opened, where there was a grocer on the corner at No. 1 and Adderley Howard lived at No. 5. This continued until 1914 when No. 1 was a grocers and a Post Office. In Kellys Directory for 1938 No 1 has been split into two properties, at 1A Cyril Luff was a tobacconist and at No. 1 James Smith was a grocers and Post Office, Nos 3 and 5 were individual residences. Ten years later in 1947 No. 1A was now a tobacconist, confectioner and stationers, with No. 1 a grocers and Post Office. No. 3 was now a wine and spirit merchants and No. 5 was a nursing home (Marine Rest Home) run by Miss Chandler. We used to walk to Wish Park for our gym lessons. I can just about remember this, and there are also details in the book ‘The Old Hove Schools’ by Judy Middleton. When we moved to Marine Avenue in the late 1980s, my daughter attended Aldrington Church of England School, also in Portland Road. They held their Sports Days at Wish Park, which was very handy for me! No worry about parking, I just walked around the corner. 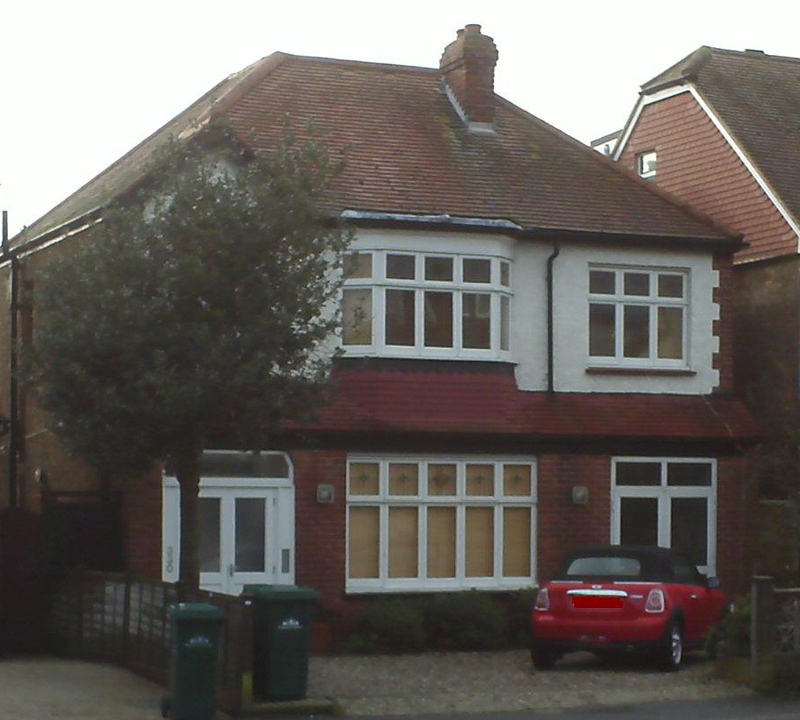 This entry was posted in Beginning life in Hove and tagged Hove. Bookmark the permalink. Aaw I love Wish Park! I remember there being a lot more trees around the edge though! I didn’t know there was a cafe there now either! Pleased you liked my blog posting of Wish Cafe and thanks for inserting link. It’s a lovely cafe and you always get a friendly welcome there. I think I’ll have to take a wander along there … a cafe is just what the park needed.